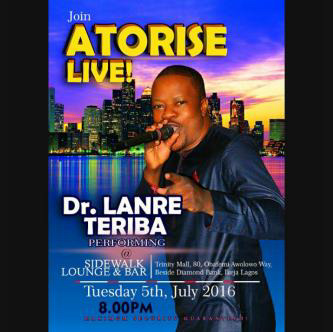 Nigerian singer, Dr Lanre Teriba Atorise will this Tuesday be performing live at Sidewalk Lounge & Bar Trinity Mall, 80, Obafemi Awolowo Way, Beside Diamond Bank, Ikeja, Lagos. This is a time to carefully enjoy a Live performance by Lanre Teriba Atorise with his Live band. Come enjoy a Live performance with your family at SIDEWALK Lounge & Bar.